Beekeeper's Mead Recipe - Home Brewing, Wines & Beers etc. This modern beekeeper’s mead recipe is designed to use the water after washing the cappings. I assume they don’t use fairy liquid when washing the cappings! 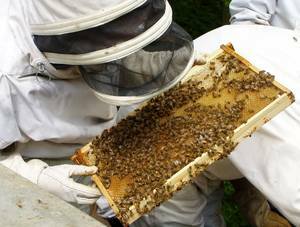 You don’t have to be a beekeeper to make it and alternatives are given in the ingredients. Honey has never been cheap to produce in Britain and the origins of this recipe come from a time when nothing was wasted, especially something as expensive as sweetness. Something we forget these days when sugar is cheap and bland foreign honey imported in barrels if not tankers. It is advised to use soft rain water as ordinary tap water will often have chlorine flavour which will taint the mead, but this is not absolutely essential. Modern water filters like the Brita system will get rid of any chlorine flavour in the waster. The proportion of honey to water can be varied: less honey produces a drier mead while more gives a sweeter, fuller-bodied wine. To use the water left after washing the cappings, strain it well through muslin into a pan and test the specific gravity with a hydrometer. The specific gravity should be between 1.06 and 1.12. More honey and water can be added as required to raise the SG. Add the tea and juice of the lemon. You can also zest the lemon, cover with boiling water and allow to soak for half an hour before straining into the pan. Sterilize the liquid by bringing it to the boil and allow to simmer for a few minutes. Skim off the scum, cover and leave it to cool in a fermenting bin or wine bucket with a lid. Place the demijohn in a cool place for six months to a year and then bottle or add a Campden tablet to stop fermentation and then rack off into bottles.